Jump Force is the hugely popular upcoming 3D fighting game by Bandai Namco that has every anime and gaming fan very hyped right now. It is a crossover fighting game where the biggest characters from Shonen Jump come on to the big stage in a massive fighting arena. Goku vs Luffy, Naruto vs Ichigo, and all those dream match-ups you would have heated discussions about your friends with are now all possible as soon as this game releases. As if releasing Vegeta and Sabo wasn’t enough, now we will see Super Saiyan Blue Goku in the game as well!? It is a rather low-quality image but it clearly shows Goku in his iconic Super Saiyan Blue form along with Luffy and Naruto as they appear in the Jump Force Game. Now this may just be a transformation for Goku or something he does while using a special move but it is exciting nonetheless. Jump Force is lining up to be very interesting. There have been so many characters for Jump Force that have been confirmed that it might be hard to keep track. So below is every character confirmed for Jump Force so far. 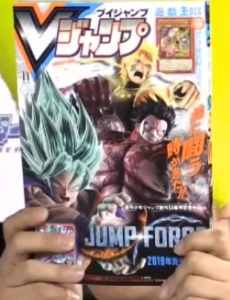 Are you excited for Jump Force? Will you be using Goku in his Super Saiyan Blue Form? Let us know in the comments below!